Some folks are acting like the lovely weather is over with back to school and labor day creeping up, and I feel the need to make a little public service announcement of sorts. Guess what! there are plenty of beautiful days and weekends left for gardening, enjoying the lake, and being outside! Get yourself to the farmers market, a yard sale, have a picnic, pick some flowers, open a window, breathe in the air, and be mindful to enjoy this before we are all locked inside our homes during the frigid winter months, especially here in Michigan. It’s beautiful out! ENJOY it! color of the month August 2015! August!?! What? Well, I know some people feel like summer is over but I feel like there are still 2 pretty solid months left! So, get out there and enjoy the beautiful weather, gardening, farmers market, and all my favorite summer things! 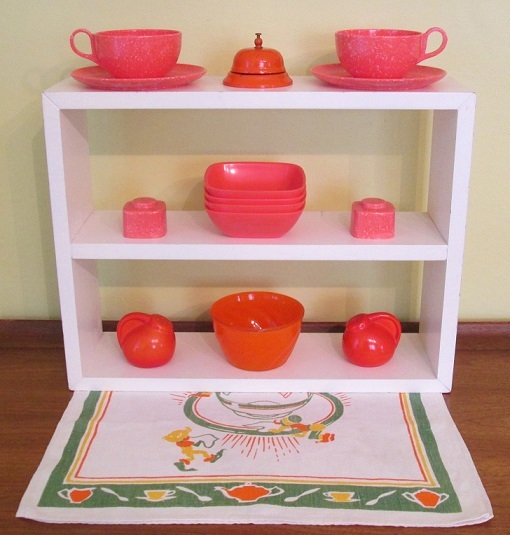 Color of the month is a lovely warm salmony coral tone. It’s like sitting in the sun. Enjoy! 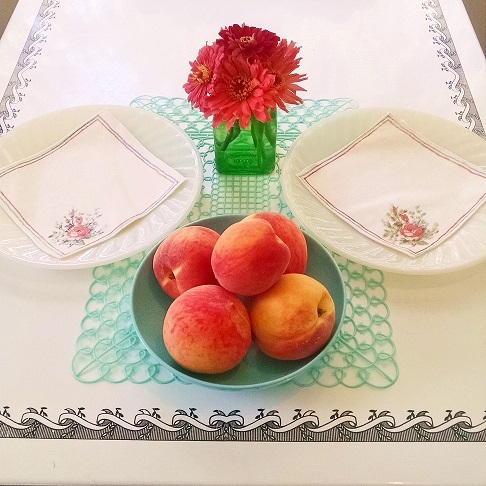 Fave vintage: speckled melmac- I love it! and this is the first time I’ve had the salt and pepper shakers! The orange bell-ding! Melmac bowls, fired on orange bowl, little jug salt and p’s, anchored by a fantastic tea towel with a tea cup and little elves! 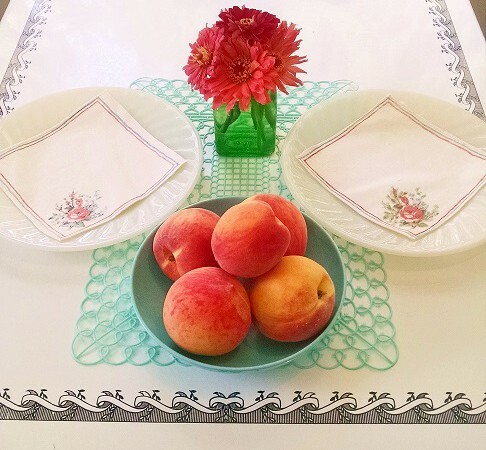 My NEW artgoodies percolator tea towel fits right into this little scene accenting perfectly with this vintage tablecloth! Other fave vintage items: melmac!!! 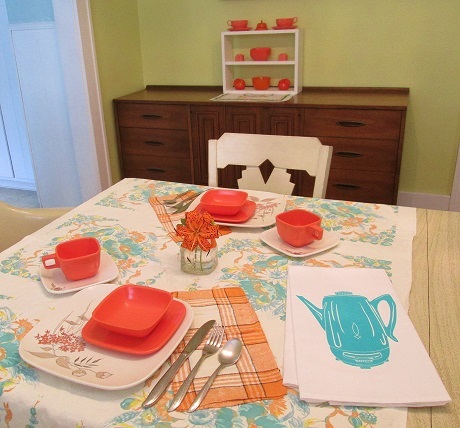 These square dishes are a nice change, plus I love the plaid napkins, and the tiger lily from my yard is an AMAZING little accent in an old Lavoris bottle! You should see it’s spots up close, pretty incredible!